Tony won his fist World MX2 Title in 2005. That’s 12 years ago. You were at a race this weekend and there were kids racing Supermini that weren’t born when he won his first title. That’s pretty crazy. To race for 12 years is something. To race Pro for 12 is another. To keep winning Pro title after title is just amazing and mind blowing! Congratulations to Tony on yet another win. I’ve had the chance to watch him race a few times. I’ve had the chance to watch top riders race since the early 1980’s. (Don’t do the math!) Tony just gets it. He’s the last guy to stop signing autographs at events and, like I said, he just gets it. He gets that being a Pro athlete is often more than just the results on the track, and that’s why people are still happy when he wins. That’s a pretty impressive list, right there. I’ll have the chance to watch him represent his country again at this year’s MXON at Matterley Basin in England. I will obviously be cheering for Canada, but I won’t be upset if and when Cairoli wins a moto or 2. He’s ‘Mr. Consistent’ at these races, so don’t be surprised if he takes one or both motos. Tony has one more championship to win to tie Stefan Everts, who has 10 and won his last MX1 title in 2006. Tony is now 31 and turning 32 this month, so we’ll see what he has left for 2018 with riders like Jeffrey Herlings clawing at him. (ASSEN) The Netherlands, 10 September 2017 – One of the most competitive seasons of the FIM Motocross World Championship’s history took to Assen for the MXGP of the Netherlands in what was the penultimate round today. Topping the weekend’s racing in their respective classes were Red Bull KTM Factory Racing’s Jeffrey Herlings and his young teammate Jorge Prado Garcia. The Red Bull KTM Factory Racing Team’s success didn’t end there as the ultimate goal of the 2017 FIM World Motocross Championship was achieved by none other the now 9 time Motocross World Champion Antonio Cairoli. Race 2 started without the likes of Gajser or Monster Energy Kawasaki Racing Team’s Clement Desalle as both had hard crashes in Race 1 and were unable to finish. On the start Rockstar Energy Husqvarna Factory Racing’s Max Nagl took the FOX Holeshot ahead of Van Horebeek, Febvre, Herlings, and his Rockstar Energy Husqvarna Factory Racing teammate Max Anstie, who finished third in race one. Herlings with an improved start moved to the on lap two making passes left and right. While Cairoli claimed the MXGP title in the early stages of the day the MX2 class had its own championship hanging in the balance. Red Bull KTM Factory Racing’s Pauls Jonass and Suzuki World MX2’s Jeremy Seewer have been fighting for the title against one another all season long. Today was neither a Jonass or Seewer show though, instead it was Red Bull KTM Factory Racing’s Jorge Prado Garcia who took the win. Behind the KTM teammates were the Rockstar Energy Husqvarna Factory Racing duo of Thomas Covington and Conrad Mewse. Mewse showed previously unseen top 5 speed at one point even battling with and passing Covington. Mewse unfortunately would fall shortly after moving to third and instead finish 6th. The Next and Ultimate Stop of the FIM Motocross World Championship will be held in 1 week time in Villars sous Ecot for the MXGP of Pays de Montbelliard. So, I was looking for some moto this past weekend and I found myself spinning around on YouTube and eventually landed on the 1987 MXON at Unadilla. It was my first time at one of these things and it was also the first time the event had been held in North America. As I was watching the video, they showed Hannah coming up and out of ‘Screw U Hill’ and I thought I caught a glimpse of a familiar face and body type on the left side of the track. After replaying it a few times, I was able to confirm that the skinny kid in the yellow, unzipped rain jacket was in fact me! Wow, talk about a weird time warp moment. Now, I understand you probably care about this sighting a whole lot less than me, but I’m posting the video anyway. It’s not often you go onto the interweb, flash back that far, and see yourself when you’re not expecting it. If you are bored out of your mind, stop the video at 9:53 to catch a glimpse of me with hair! Hey, Monday Morning Coffee is where I just blab on about anything I want, so if you want your money back, you’re not getting it! Watch for lots of pics and some video from what should be another great day on Yamahas at Motopark. 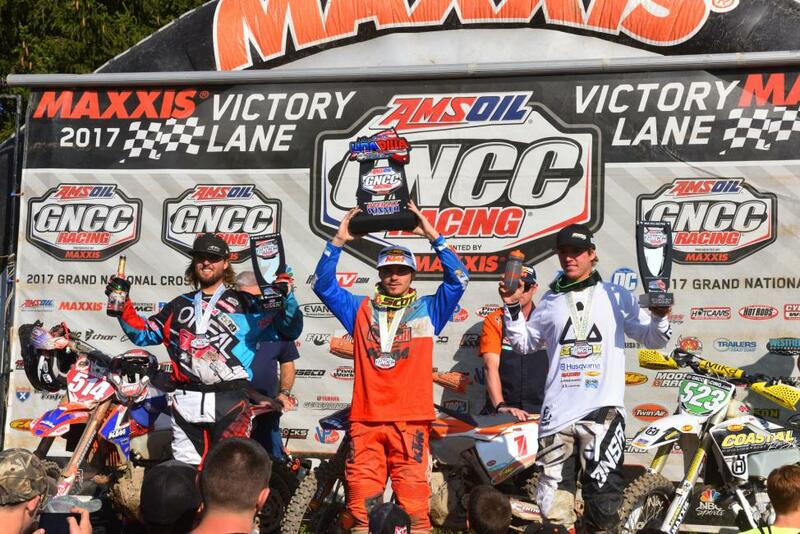 The final GNCC round took place at Unadilla and is actually why I got looking on YouTube. 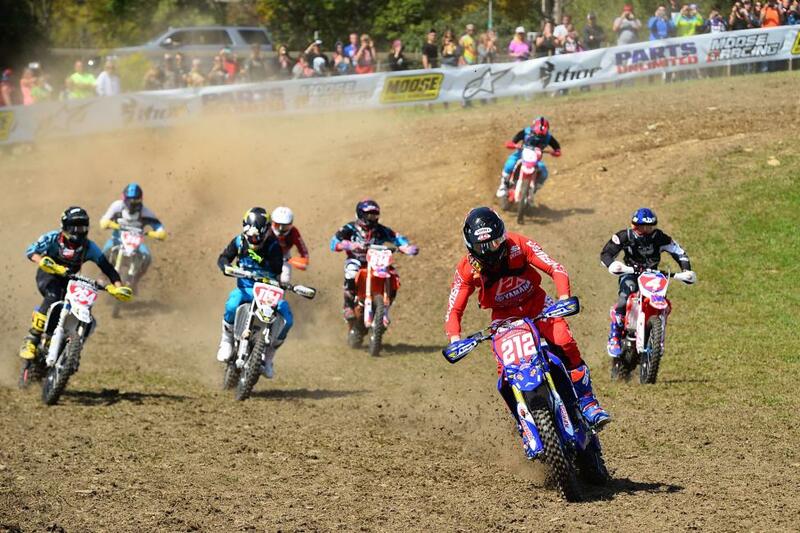 Canadian MXer Hayden Halstead headed to New York State for this one. Congrats to everyone who made the effort to line up. We’ll try to grab Hayden for a conversation this week to talk about the event. NEW BERLIN, N.Y. (September 11, 2017) – New Berlin, New York was jam-packed with America’s fastest off-road racers as they competed in the 13th Annual Parts Unlimited Unadilla GNCC at the famous Unadilla MX this weekend, Sunday, September 10. 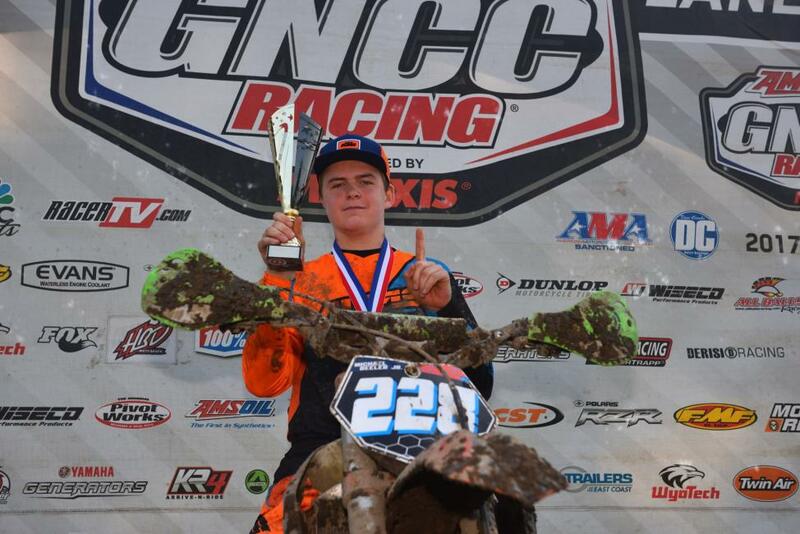 At the end of the three-hour race, it was FMF/KTM Factory Racing’s Kailub Russell claiming the win at the tenth round of the 43rd Annual AMSOIL Grand National Cross Country (GNCC) Series presented by Maxxis, an AMA National Championship. With anticipation at an all-time high with the return of racing after a two-month “summer break” hiatus, it was N-Fab/AmPro Yamaha’s Ricky Russell rocketing off the start to claim the $250 All Balls Racing Holeshot Award. Even though FMF/KTM Factory Racing’s Russell Bobbitt was second through the holeshot, it would be Beta USA’s Jordan Ashburn in the runner-up position as they entered the woods. As the group settled into pace on the first lap, R Russell continue to lead with pressure from Coastal Racing/Husqvarna’s Ryan Sipes. Throughout the remainder of the first lap they continued swapping positions, but when they checked through scoring for the first time it was R Russell accredited with the lead. K Russell was in third after working his way through the pack after getting a bad start. The FMF Powerpoint came to be the biggest obstacle of the race throughout the entire three hours. Once K Russell secured the lead, it didn’t last long due to becoming victim of the hill climb. R Russell was so close to him that when K Russell went down, he was stuck right behind him – this allowed Ashburn to move into the lead. K Russell and R Russell quickly recovered and moved back into second and third behind Ashburn on lap four. K Russell took the lead back on the fourth lap and attempted to gap his competitors, where he neglected to pit and keep going for an additional lap. R Russell also skipped his pit and passed Ashburn, who did pit, for second. R Russell kept the momentum rolling and passed K Russell again on the fifth lap, but K Russell was back into the lead when they jumped the Sky Shot obstacle on the motocross track. Unfortunately Sipes was forced to end his race early after suffering from tendinitis that occurred at the ISDE. When the race reached the halfway point, SRT/KTM’s Stew Baylor had put himself in podium contention and began pushing to catch R Russell. When the two-lap board came out, Baylor moved in second behind K Russell. R Russell struggled up the FMF Powerpoint again, but still sat in third. K Russell was the first rider through the finish, taking the overall win with Baylor following in second, but attention was turned to the third overall position where the XC2 250 Pro class leaders were in contention. R Russell was pushed to the finish by JCR Honda’s Trevor Bollinger. 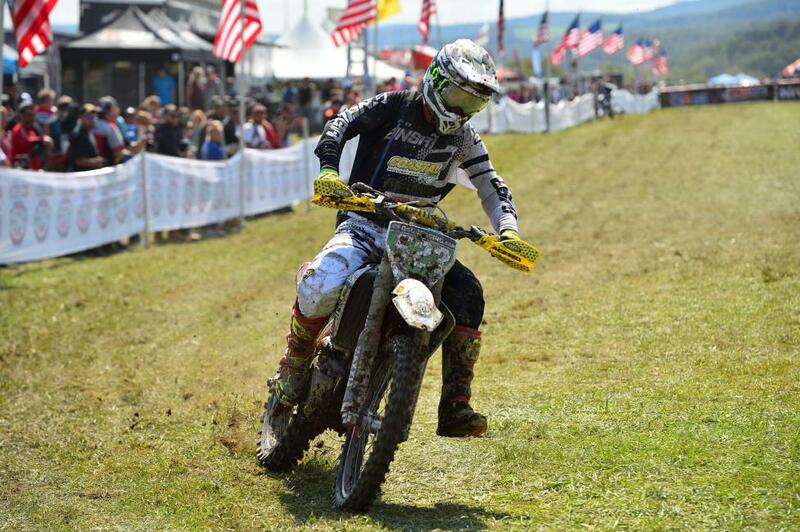 However, Coastal Racing/Husqvarna’s Layne Michael was awarded with third overall on adjusted time. 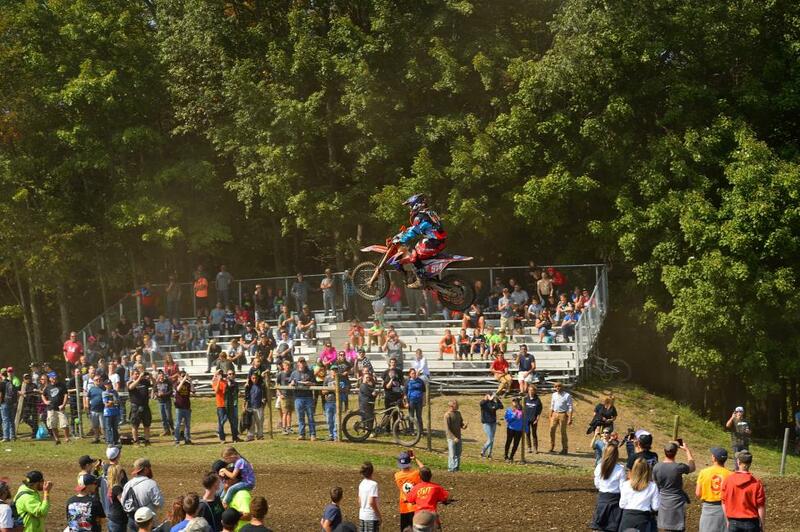 Trail Jesters/KTM Racing’s Ben Kelley was in a close second in class and fifth overall. R Russell finished third in XC1 Pro and fifth overall, and Bollinger finished sixth overall and just off the XC1 podium in fourth. Ashburn, Toth and Bobbitt rounded out the top ten overall. Rockstar Energy/Factory Husqvarna Racing’s Josh Strang bobbled into a mud hole on the second lap and had to take an extra long pit stop to get a fresh set of gloves. However, more bad luck came Strang’s way and he was forced to end his race early with a mechanical issue. Zach Nolan found himself in a favorable position to earn the $100 Hot Cams XC2 Holeshot Award, and finished the race in thirteenth. Nate Smith was accredited with the FMF XC3 125 Pro-Am class holeshot. Jason Thomas, N-Fab N-Fab/AmPro Yamaha’s Paul Whibley and Rocky Mountain ATV*MC/KR4/ Husqvarna Team’s Hunter Neuwirth stood on the box for the FMF XC3 125 Pro-Am class. With 15th overall Alex Teagarden was awarded the top amateur award. Levi Keller and Jonathan Johnson followed in second and third for the amateur overall podium in the 1 p.m. Pro Race. The WXC division dominated the 10 a.m. overall standings. Fly Racing/Maxxis/Seat Concepts/KTM’s Becca Sheets kept Rocky Mountain ATV*MC/KR4/Husqvarna Team-backed Tayla Jones honest, but had to settle for second. Jones’ win vaulted her to the top of the championship standings where she secured the No. 1 plate three rounds early. The Motorcycle Shop/Kenda/Bell/V3 Off-Road’s Brooke Cosner finished third overall, respectively. Michael Beeler Jr. had an exceptional race in the youth division, winning the overall on adjusted time and crossing the line physically in second after starting on the second row. Super Mini Sr. class winner Zack Davidson placed second overall and Peyton Whipkey rounded out the podium. The 1 p.m. race was broadcast LIVE in its entirety on RacerTV.com and can be viewed as an archived video now by visiting the GNCC LIVE page online. A highlight show featuring the event will air on NBC Sports Network on Saturday, October 28 at 4:30 p.m. 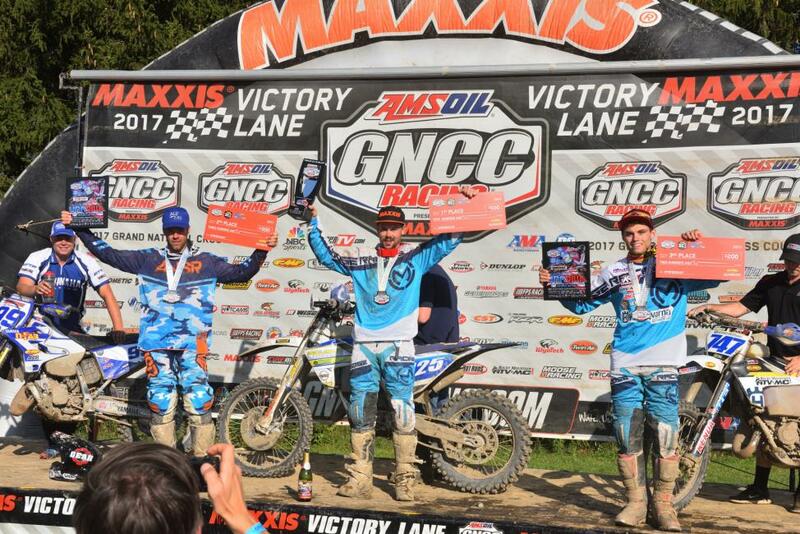 The 2017 AMSOIL Grand National Cross Country Series travels to Masontown, West Virginia in two weeks for the Rocky Mountain ATV/MC Mountaineer Run GNCC on September 23 and 24. 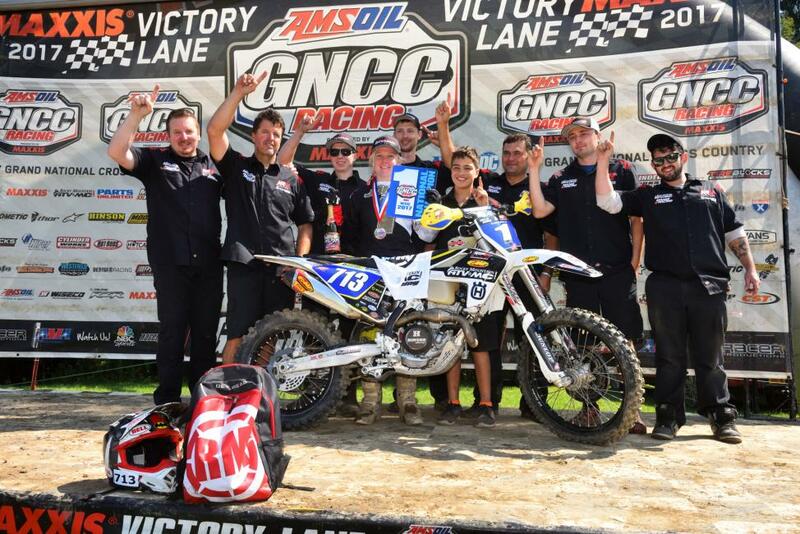 For more information on the series, visit the official website at www.gnccracing.com call (304) 284-0084. Join the conversation on the series Facebook page, follow us on Twitter and Instagram, and be sure to always hashtag #GNCC. OK, have a great weekend and thanks for reading.